Doral is part of the vibrant Miami area and not only has some of the best real estate in Florida, but it also offers residents and visitors alike a shopping experience on par with any large metro area. The Miami International Mall and Dolphin Mall are both located in and around Doral and have shops, restaurants, and events to suit almost any taste. If you want it, chances are you’ll find it at one or both of these popular shopping destinations. Doral is a unique community situated within minutes of Miami. It is rated as one of the top cities to live in for the state and the nation. A high employment rate, affordable real estate, and healthy economy all combine to make Doral the fastest growing community in the Miami/Dade area, and Doral real estate one of the strongest markets in the country. 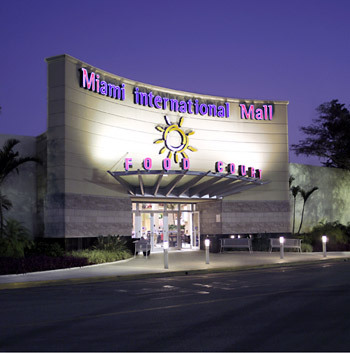 The Miami International Mall gets its name from its close proximity to the Miami International Airport. The five anchor stores are JC Penney, Sears, Dillards, Kohls, and Macy’s. It was opened in 1982 and at that time included live trees, penny fountains, a children’s train, and a large center court fountain. The mall went through a downturn in the 1990’s, but it has been renovated and celebrated its re-grand opening in 2001. The Miami International Mall is now a hallmark of modern design and shopping convenience. Over 140 stores call the mall home and include stores such as The Gap, Payless Shoesource, The Limited, Victoria’s Secret, and Bath and Body Works. The Simon Property Group owns and manages the mall. Visitors to the mall will find a modern shopping facility tailored to the 21st Century. Shoppers can register at the mall’s website and receive advance notice of deals and events. The Dolphin Mall is a popular outlet mall situated between Doral and Miami in Sweetwater. 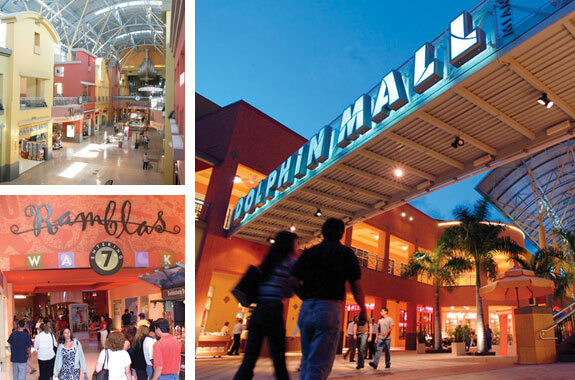 One of the largest outlet malls in Florida, the Dolphin Mall has over 240 shops for shoppers to choose from. These include Banana Republic, Bloomingdales, Coach, The Gap Factory Store, Nike Factory Store and many more large names offering great deals on factory outlet buys. The Dolphin Mall also offers shoppers special events and sales throughout the year. The mall has free live entertainment each weekend and a cinema which shows the latest releases. If shoppers get hungry they can make the choice of several fares including popular favorites like Burger King, Dave and Busters, or TGI Fridays. Starbucks and Haagen-Dazs offer shoppers a quick pick me up and treats to keep them energized. The Dolphin Mall is also owned by the Simon Property Group and is known for its upscale outlet shopping experience. Doral not only offers residents and visitors a stable and vibrant economy, growing real estate market, and close proximity to all that Florida offers but a shopping experience you’d expect to find in a much larger metro area. As one of the fastest growing areas in the state, Doral has something for everyone.